Mermaids might be my favorite fairy tale creature! They're so alluring. I also love Sirens, which are very similar. I used over 15 polishes for this, which is why it looks a little crazy! This is also why I'm not going to list all of the names. My tool was the end of a bobby pin. I think it would be fun to do a whole series of nails based on fairy tale creatures or mythology. Maybe Medusa should be next? That's a great idea!!! 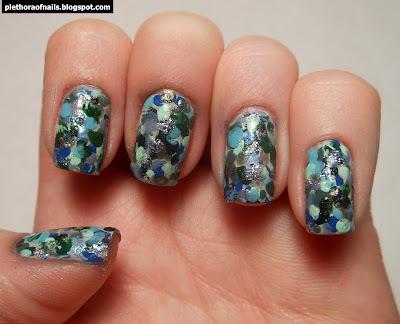 Love the mermaid scales!